Juanita Greer White earned a doctorate in physical chemistry from Johns Hopkins University in 1929 at a time when women were unwelcome in the scientific professions. She established a career as a professor and researcher before moving to Boulder City in 1955, where her husband Thomas established a surgical practice. She immediately became active in the community and in 1962 voters elected her to the Nevada Board of Regents. In 1971 she was elected to the State Assembly. As a Regent, White was an outspoken supporter of Nevada Southern. When the Southern University Land Foundation proposed acquiring 50 acres for the university, White insisted on the 300 acres that now make up UNLV’s main campus. 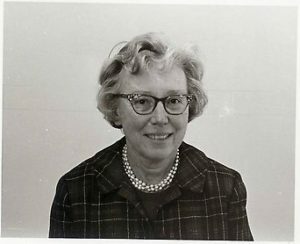 As part of the 1964 Governor’s Commission on the Status of Women, she strongly advocated for programs that would increase women’s access to higher education in the state. She remained actively involved with UNLV, particularly the biology department, until her death in 1997. The Life Sciences building was renamed as a tribute to her lifetime of service to the sciences, higher education, and the Southern Nevada community. Source: Eugene Moehring, UNLV: A History, (Reno: University of Nevada Press, 2007).